Your 9-ball game will improve dramatically with these two drills. If you haven�t guessed by now, I am a big proponent of practicing with purpose. I can get twice the benefit out of two hours of meaningful, structured practice than I would simply throwing the balls on the table and banging them around for eight hours. The great thing about a good practice drill as that it will help with all facets of your game. It will help your stroke, your position play, your pocketing�everything. So, when I haven�t played in a while and I want to work on my stroke and patterns, I always start with this rotation drill. 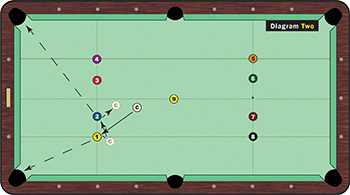 I think it is the best 9-ball drill because every shot is something that is going to come up in a normal match. It offers a nice mixture of shots, and regardless of your position play, some of them aren�t going to be hangers. It�s also good because you have to go up and down the table on each shot. Place the balls as shown in Diagram One. I always start out with a longish, medium-hard shot. It�s good to start with a medium range shot that isn�t too easy, but is still a shot you should make. Let�s face it. In a real match, you don�t usually get a super easy shot at the 1 after the break. The keys to this drill are staying on the right side of the ball and leaving a decent angle. Leaving a decent angle may make the shots a little more difficult, but you have to trust your ability to pocket balls. Many amateurs tend to get too straight on shots because they are worried about missing the ball. That often ends up backfiring, because angles are the key to good pattern play. In this drill, if you get straight on one of the balls along the rail, you are going to be in trouble. This drill is also an excellent way to gauge speed and cue ball action. You will hit some shots with center cue ball, while other shots will require you to spin the cue ball. It is a great drill to get a feel for the game. Complete this drill a few times and your game is going to be in good shape. And because every table tends to play differently, this is a good drill when you are warming up for a tournament match or on league night. 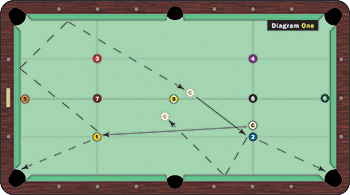 While the break shot and pattern play are very important in 9-ball, touch is also critical. The drill in Diagram Two is a nice follow-up to the first drill because it forces you to pinch the pockets and get the proper speed on the cue ball. There are times you really need tight control on the cue ball. When you need to kill the cue ball, you have to have a good feel for your stroke. You need to be able to shorten your stroke and decelerate. For this drill, place the balls as shown and run them in rotation without touching a rail. As in the previous drill, staying on the right side of the object ball is essential. Because you want to kill the cue ball on most of these shots, you need to be relatively straight and have to cheat the pockets just a bit to create a little angle. This drill may look easy, but it is not. If you complete this 50 percent of the time, it will show that you have good touch and can play in small areas. Touch is important to a player like me, because there are a lot of players who have better shot-making skills. When I was younger, I didn�t worry much about the cue ball because I could shoot from anywhere. After years of battle scars and missing a few key shots, however, I realized that if I had a little better control of the cue ball, those shots would have been much easier.